Since the Offshore Technology Conference is happening, we’ve been discussing offshore quite a bit this week, and I thought I would explore how offshore drilling works. Being geographically close to the Gulf of Mexico (GoM), I’m going focus my attention there. Our recent analysis of top oil producing and top gas producing counties included some big offshore areas. Deepwater areas Green Canyon, Mississippi Canyon and Alaminos Canyon were top twenty for oil production in the US (Green Canyon #1 and Mississippi Canyon #3), and Mississippi Canyon was #25 for gas production. Recently The Lower Tertiary in the GoM has been in the news with huge potential – 15 billion barrels of oil. Compare that to EIA estimated 29 billion barrels in reserve onshore US, and you have a great exploration opportunity. To Explore and Produce offshore you need a platform (typically referred to as a rig) from which to drill wells, extract product, and in most cases store the oil or gas until it can be transported to refineries or other destinations. The Geology of the GoM is largely Jurassic and Cretaceous, when the basin encouraged collection and evaporation of sea water, leaving behind accumulations of Salt and Gypsum, which then domed and trapped abundant hydrocarbons. Beyond the state boundaries in the GoM there are Offshore Protraction Areas that are further subdivided into blocks that go up for bid from the federal government. According to the following BOEM chart, most of the big money bids were in the 70s and 80s, but sale number 222 in 2012 netted $157 million for lease G34456 in the central district! What types of Rigs are there? There are three primary rig types. Jackups, semisubmersibles and drillships make up the majority of the offshore rig fleet and all are used worldwide. Other rig types such as platform rigs, inland barges and tender-assisted rigs are used as well, but they are fewer in number and are generally used in specific geographic areas. Jack-ups – Used for shallow water drilling, there are two jackup types; independent-leg jackups make up the majority of the existing fleet. They have legs that penetrate into the seafloor and the hull jacks up and down the legs. Mat-supported jackups are presently used only in the U.S. GoM. As the name implies, the mat rests on the seafloor during drilling operations. Cantilever jackups are able to skid out over the platform or well location, while slot units have a slot that fits around a platform when drilling development wells. Semisubmersibles – Used for deepwater drilling, these floating rigs have columns that are ballasted to remain on location either by mooring lines anchored to the seafloor or by dynamic positioning systems. They are used for both exploratory and development drilling. Drillships – Also used for deepwater drilling, these ship-shaped floating rigs move from location to location under their own power. They are capable of operating in more remote locations and require fewer supply boat trips than do semis. They are maintained on location via dynamic positioning systems, and most of the rigs currently under construction are drillships. Platform Rigs – These are self-contained rigs that are placed on fixed platforms for field development drilling. Some are called self-erecting and can be rigged up in as little as a few days. Other larger units require a derrick barge to be installed and can take up to two weeks to be rigged up. Once drilling is completed, the rig is removed from the platform. Tender-Assist Rigs – There are only about 25 of these rigs left in existence, used mostly in West Africa and Southeast Asia. They are monohull units that are moored next to a platform. The rig is then installed onto the platform, while all the power, storage and other functions remain on the tender. Inland Barges – These rigs are specially adapted for inland waters close to shore. They are used in the GoM as well as other areas of the world. 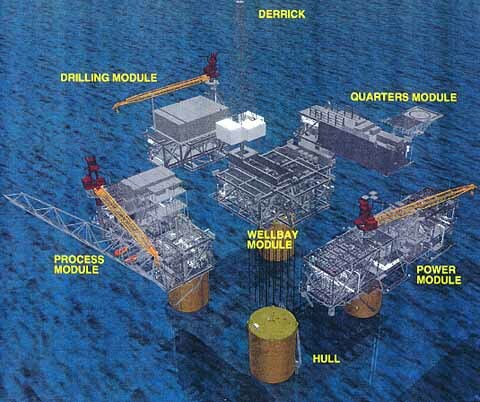 What are the components of an Offshore Rig? There are several shipyards around the world that build offshore rigs. Most of the major yards are in Southeast Asia and the Far East and there are other facilities in the Middle East and others being established in Brazil. Samsung Heavy Industries in Korea, and Keppel Corporation in Singapore are two of the larger rig builders in the world..
Tugboats are used to move jackups and semis for infield moves. When rigs are moved from one geographic area to another, usually a heavy-lift vessel is deployed, commonly called dry-tow. In some cases, semis might be what is called wet-towed, in which the rig is towed while in the water. Of course, drillships move under their own power in any situation. As one can imagine, it can be a pretty big production to move a rig from one area to another – a new rig being built in Singapore will take 90 days to reach the GoM. Who hires and runs Offshore Rigs? Obviously oil companies are the ones that hire an offshore rig. In the Gulf of Mexico, super-majors BP, Chevron, ExxonMobil, Shell and ConocoPhillips all have rigs under contract, and large independents such as Anadarko Petroleum and Fieldwood Energy (formerly Apache) are extremely active. In many instances, companies will partner in hiring a rig, with each operator involved getting the rig for a set number of wells or days. The Offshore Installation Manager (OIM) has the executive authority on a rig during his shift. Beyond that, there are various other positions, all with very specific roles to play in order to keep the rig running smoothly. The number of crew personnel on a rig varies between rig types and where the rig is operating. There can be as few as 50 and as many as 200. Given that there are currently over 200 rigs being built, one of the problems facing the industry today is how they are going to be staffed. Obviously, some of the people will come from older rigs that are retired over time and the crew is simply is transferred to a new rig. However, there is still a large people shortage coming. Oilpro.com looked at the current rig fleet age along with projected staffing requirements for newbuild rigs. How deep do Offshore Rigs drill? Depending on the rig type, offshore rigs are rated to drill in water depths as shallow as 80 feet to as great as 12,000 feet. The greatest water depth a jackup can drill in is 550 feet, and many newer units have a rated drilling depth of 35,000 feet. On the floating rig side, the deepest water depth in existence today is 12,000 feet. A handful of these rigs have a rated drilling depth of 50,000 feet, but most of the newer units are rated at 40,000 feet. How do they get supplies to an offshore rig? Supply boats is the answer. These vessels make regularly scheduled trips to and from the rigs, bringing necessary equipment, food and other supplies. Crews are generally transported by either helicopter or crew boats, depending on how far the trip is. How do they get production out? Oil and/or natural gas production is connected by a flow line to another facility or connects into a large diameter trunk line that is heading to the onshore location for processing. Newer technology involves a Floating Production System Offloading (FPSO) which can store oil in its hull where it is later transported to shore. While this is a proven technology around the world, it is just now starting to be used in the GoM. Although in this post I focused on the GoM, our DI International products have annotated bid blocks, scouting reports, and extensive editorial information for round the world offshore opportunities. If you’re curious about Angola or the North Sea or Vietnam, we can help you navigate. What do you think? What have you always wanted to know about offshore drilling? Like me, do you want to visit an oil rig? Leave a comment below.